Inspired by my first employer, Tony Barringer, who developed the "E-Phase" system to measure the electric field wavetilt at VLF frequencies on an airborne platform, David Goldak developed a high input impedance pre-amp suitable for amplification of voltage from a whip antenna for the purpose of measuring the vertical electric field. 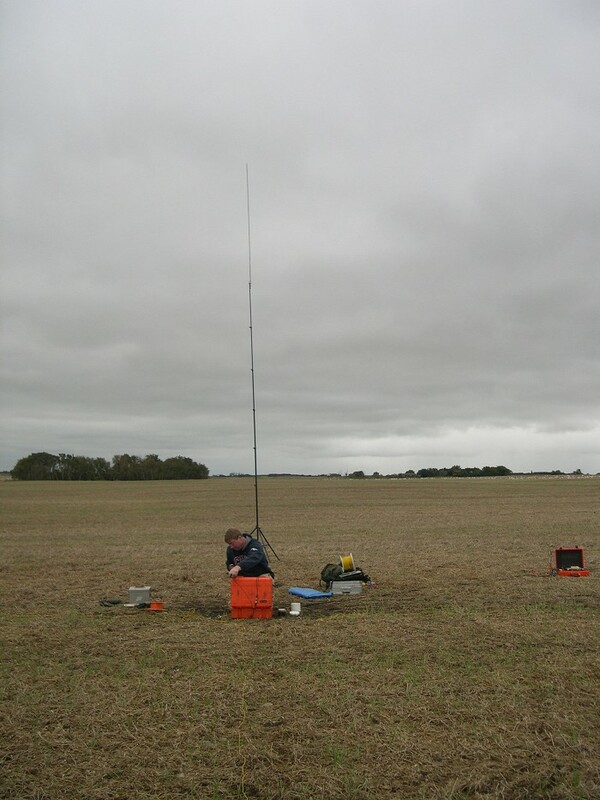 A 2.5 m collapsible whip antenna is shown below, attached to a telescoping mast which can place the centre of the whip as high as 6.5 m.
In order to achieve good sensitivity, the input impedance of the pre-amp needs to be much larger than the capacitive reactance of the antenna. This becomes difficult as frequency decreases, a very large input impedance is required because the capacitive reactance of the whip increases as frequency decreases. This problem is solved through "boot-strapping" techniques which results in a very large input impedance for AC signals but still allows DC currents from the op-amp to flow to ground. Note that for lightning sourced signals, or "atmospherics", or "sferics" for short, the electromagnetic signal propagates as an oscillating vertical electric field, tilted slightly forward in the direction of propagation (due to the very small by comparison, horizontal electric field, which is present due to energy losses into the earth) and an oscillating azimuthal magnetic field. The horizontal magnetic field and vertical electric field are seen to be "carbon-copies" of each other, simply being scaled by the impedance of free space. 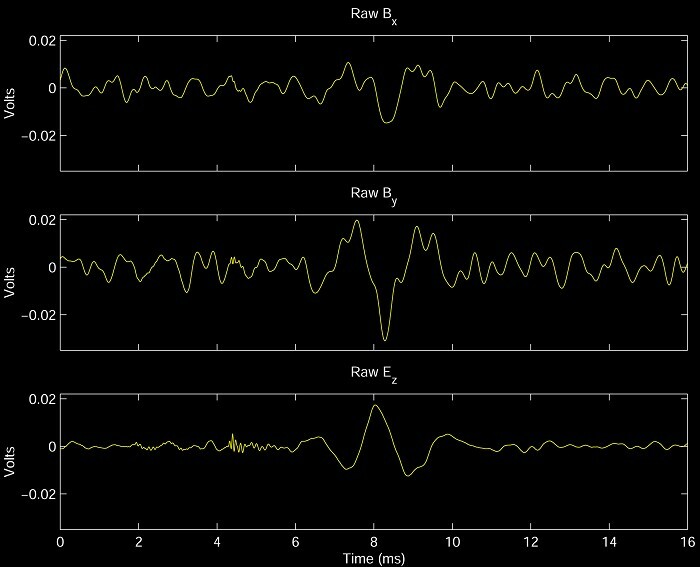 The vertical electric field appears to offer two enhancements to AMT data; the enhanced reception of signals in the AMT "dead-band" from 500 Hz to 5000 Hz, and the detection of near field events through measurement of the wave impedance. It should also be possible to measure an electric field wavetilt resistivity on the ground using "sferics", but that remains to be pursued. The first application is very useful in situations when source-receiver separation is large, greater than 3000 km. This is generally the case for fall or winter surveys, or those at high latitude in any season. The second application is very useful when source-receiver separation becomes too small, as can happen in equatorial zones, at any time of the year. For a plane wave event (at VLF frequencies), the ratio of the vertical electric field to the azimuthal magnetic field intensity should equal the impedance of free space, just under 377 Ohms. Shown below are two examples of the "dead-band" denoising capabilities possible with vertical E. The first is from a forested environment in northern Saskatchewan, collected in the fall. 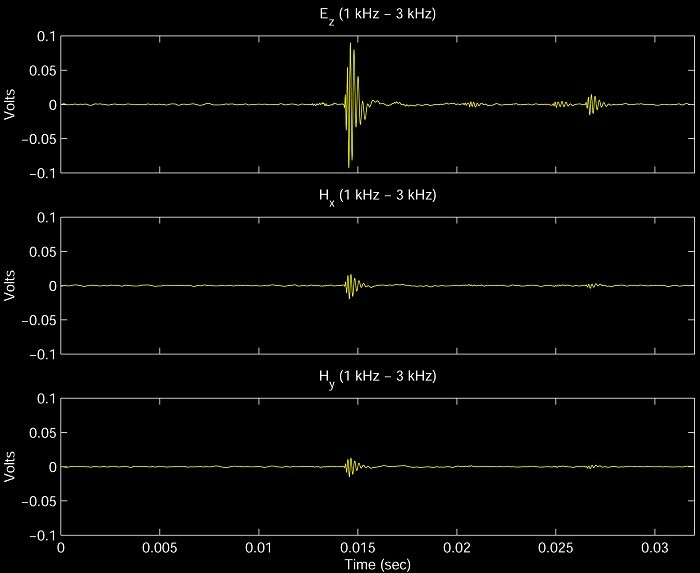 The coils used in that survey had a noise floor of 2 fempto-Tesla/root(Hz) in the 500 Hz to 5000 Hz range, the vertical electric field in this case provides about 3 times lower noise floor than that seen on the coils, allowing for significantly enhanced detection of transients. Note that the vertical scale on the Ez plot below is clipped for comparison with the coil data above. Shown below is an example from the Diavik diamond mine, at 64 degrees North latitude, collected in January, 2006. In this case, the data has been band-pass filtered from 500 Hz to 1000 Hz to display the signal-to-noise enhancement possibilities with vertical E on the "low-side" of the AMT dead band. 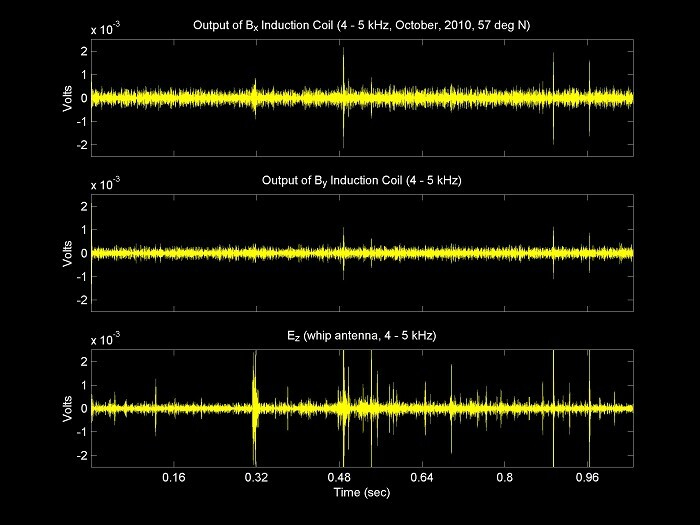 Once again, a significant increase in signal-to-noise ratio is seen with vertical E, simulating the effect of coils with noise floor below 1 fempto-Tesla/root(Hz). Shown below is an example from the Shea Creek area of northern Saskatchewan, collected in the summer of 2005. The main issue that needs to be solved with this measurement is estimating the effective height of the antenna, or equivalently, the antenna capacitance. Without knowing the effective height of the antenna, the vertical electric field data cannot be correctly converted from measured Volts to desired units of Volts/metre. The effective height of the antenna is generally less than the physical height (the distance to the centre of the whip) due to the finite conductivity of the earth and objects around the whip antenna, such as trees, etc., which reduce the capacitance of the whip. David Goldak has developed an approach to measure antenna capacitance and therefore this problem may be solved, but remains to be demonstrated. A related issue is the variation in antenna pickup due to humidity, the data above were collected with a fairly crude PCB that is unencapsulated (exposed to the air). Furthermore, the noise properties of our pre-amp itself could be improved upon substantially through an optimization of the passive elements involved in the feedback network, encapsulating the pre-amp in epoxy should further help to maintain the high input impedance independent of atmospheric humidity. It may be possible to adapt this pre-amp for the measurement of the horizontal electric field with, for example, a long wire lying on the ground as per the work of David Thiel in the late 1980's. As opposed to traditional AMT, where the electric field is estimated through point measurements of voltage, a horizontal wire antenna measurement would represent an integration of potential over the volume of the antenna, possibly alleviating near surface distorting effects on the horizontal electric field. However, it remains for industry to see the value in the vertical E measurement and provide field work/funding so that this very promising measurement may be further developed.